Big Brother Naija 2018 reality TV star, Ahneeka send a message to those on her matter and her plan is to sleep with their fathers if they don’t stop. 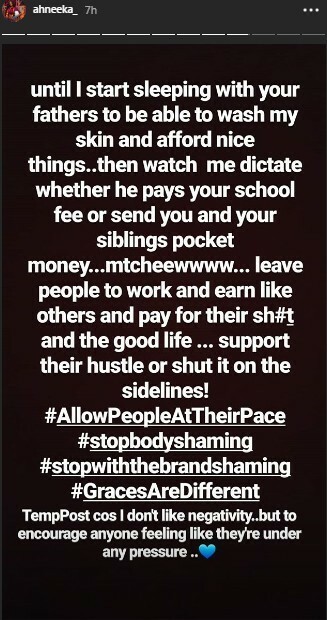 BBNaija Ahneeka whose post advocated for allowing people to develop at their own pace, asked trolls to allow her work and earn like others to afford the good life and also pay her bills. Ahneeka had before now, had her own fair share of trolling on social media. The former BBNaija housemate, had a message for those who thought it was okay to call her out due to the acne on her face. Stay connected for more updates and latest news from Big Brother Nigeria 2019 housemates.